Several randomized controlled studies have shown that bowel prep is unnecessary in open colectomy.1,2, 3 Laparoscopic colectomy is a viable alternative to open colectomy for most disease conditions, and offers significant benefits of decreased pain, length of stay, and faster recovery. The use of bowel prep in laparoscopic colectomy has not been examined in a randomized study. Bowel prep is uncomfortable, time-consuming, and has associated cost. Historically, it was considered necessary to reduce complications of wound infection, intra-abdominal abscess, and anastomotic leak. 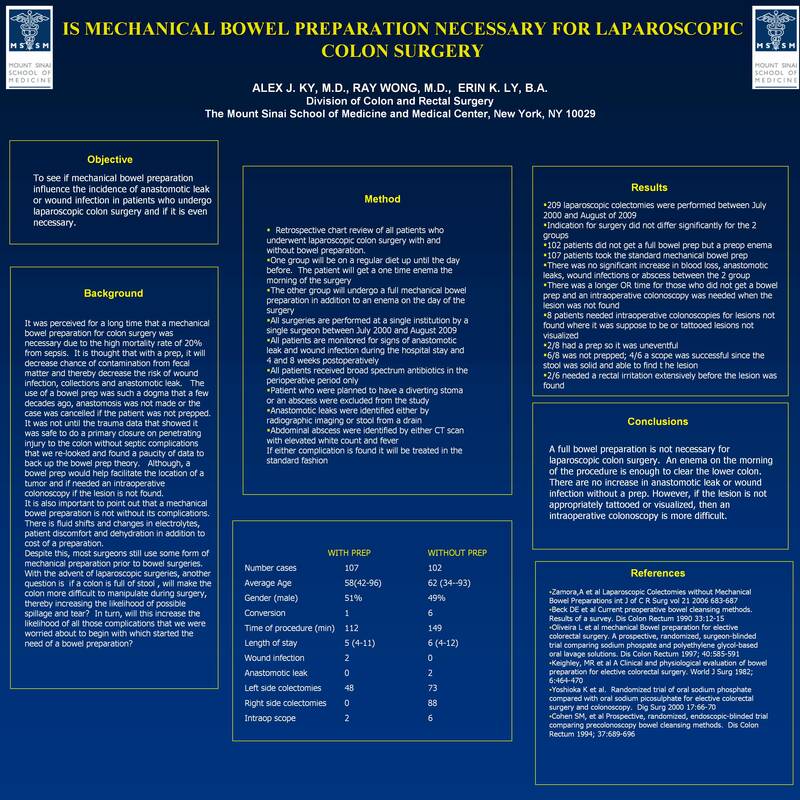 Objective: To evaluate if the use of mechanical bowel preparation before elective colon surgery is necessary. Method: A prospective review of cases was performed between July 2000 and Aug 2009. A total of 209 laparoscopic colectomies were performed by the same surgeon. Patients were randomized into the prep and no prep group. OR time, blood loss and conversion were recorded along with postoperative complications of wound infection, abdominal abscess, anastomotic leak recorded, both during inpatient stays and at office visits. Results: 102 patients did not get full bowel prep but a preoperative enema while107 patient took some form of mechanical prep. There was no significant increase in time, blood loss, anastomotic leak or abscesses between the 2 groups. There is a longer operative time for those patients who did not get bowel prep and the lesion could not be found. There was also no increase in wound infection in patients who did not get bowel prep. 8 patients needed intraoperative colonoscopy for failure to identify the lesion. Conclusion: Mechanical bowel prep has long been used in both open and laparoscopic cases. Not doing prep does make it a little more difficulty in handling of the bowel and also smaller lesions more difficult to locate.